Voluminous and mystical, esoteric and ominous is the album by a Spanish musician Ran Kirlian, called “Isolated Landscapes”. Especially, while listening to the second “Enlightment Cycle”, with its almost Tibetan solid mantric ringing and sounding, you can feel this powerful and puzzling experience. I don’t know exactly, whether it was the use of natural musical instruments, or synthesized means, but the whole impression of an inspired or even ecstatic ensemble is created. This album reminds me of some strongly isolated ceremony, the ceremony of transformation and dissolution in space, when the consciousness is not already concentrated in just one point, but it merged with the Universe. The sounds are truly pleasant for a drone-lover, and moreover, their duration makes us glad either – the tracks are in the range of 13-27 minutes, so you are sure to have a thorough meditative spare time, and completely to surrender to this tumultuous ocean of sonic waves. For me personally, music from this album turned out to be a psychedelic experience, in its strict sense, for my PSYCHics was really DELighted. The huge, enveloping layers of bells, some fluffy atmospheres, vocals, resembling throat signing, powerful background low drones are the determinant elements in making of this peculiar, unworldly and transcendental climate. 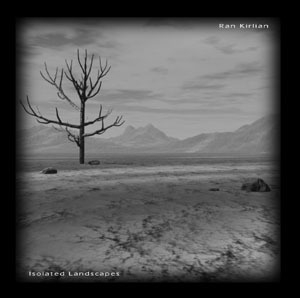 So, have a continuous glance at “Isolated Landscapes” by Ran Kirlian.